Just what happens on a wellness retreat depends, largely, on what you’re looking for. Need a weekend away to yourself, a few days, an entire week or even longer? Health resorts and wellness retreats come in all shapes and sizes, so you can always find one to fit your schedule. Curious to understand more about the hype surrounding wellness getaways? Here’s a primer on what to expect from a wellness retreat. What is a wellness resort? A wellness retreat is a getaway where you have access to resources that better your physical, mental or spiritual state. Most wellness retreats happen in stunning natural surroundings. Think mountains, oceans, hot springs, crystal waters, quiet pools, lush foliage or some combination of all of the above. These natural environments help you relax and unwind. When you’re surrounded by nature during a wellness getaway, your problems don’t seem quite so massive anymore. Natural settings also make for incredible photos. Wellness getaways can be in exotic locales far away or tucked away in the area you already live. Instead of a vacation where you come back even more exhausted by all you did, a health retreat aims for you to leave the experience feeling recharged and energized. Many people go to a wellness retreat to unplug and recharge. Some resorts have a suggested no cellphone policy, others ban all electronics outright. With all the distractions in our daily lives, sometimes people feel completely disoriented without the potential for constant contact. But when you unplug, you’re able to focus more on the present, whether it’s eating a delicious meal, getting a massage, connecting with new people or simply going on a hike. Eliminating distractions also allows you to turn your thoughts inwards. Maybe you’ll meditate, do yoga or try another mindfulness practice. Maybe you’ll sit in a quiet spot and just look at the sky. Having free time lets you really decompress and reconnect to what it is you really want. Wellness retreats usually include some kind of cleanse, from a detoxifying meal plan to colonics, which irrigate your colon as a way to speed up the detox process. For example, at Life Mastery, participants detox with a food program packed with nutrient-rich vegetable and fruit juices, raw foods, fresh wheatgrass and essential oils to quickly cleanse the body of unwanted toxins and restore vital nutrients. The results? Reclaimed energy and enhanced mental processing. Even with all the relaxing you’ll do at a wellness retreat, that doesn’t mean you’ll be sitting still. With your unplugged lifestyle, you’ll have time and energy for everything from fitness classes to hikes, massages to swims. Pursuing your physical, mental and spiritual interests in a way that makes you feel truly recharged is a core component of a wellness retreat. And, depending on location, don’t forget the range of possible spa treatments. Of course, the secret to a health retreat is to understand how to replicate the process back home. Even if you don’t have the same incredible view or option to be unplugged 24/7, quality wellness retreats educate attendees on how to keep up their new habits. Maybe this is incorporating aerobic exercise into your daily routine, learning how to prepare raw foods, or creating a sustainable meal plan that fits your lifestyle. After spending all this time making your body and mind feel great, you don’t want to slip back into the bad habits you’ve broken, whether it’s caffeine addiction or candy. Wellness is attainable, but you may need some help jumpstarting your road to revitalization. 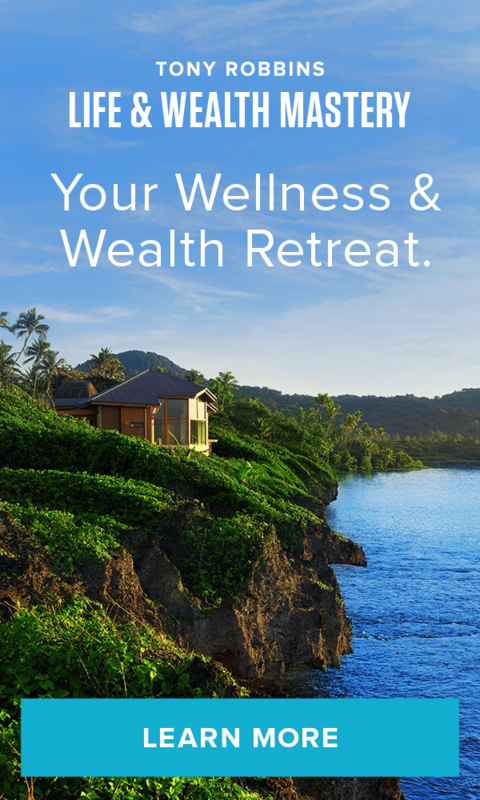 Life & Wealth Mastery is an eight-day immersive experience that allows you to completely recharge and reevaluate your physical, mental and financial goals. Full of energizing exercises and relaxing practices, this Tony Robbins event will help you transform your life for the better. Ready for an event that will help you revitalize your health and finances? Attend Life & Wealth Mastery.